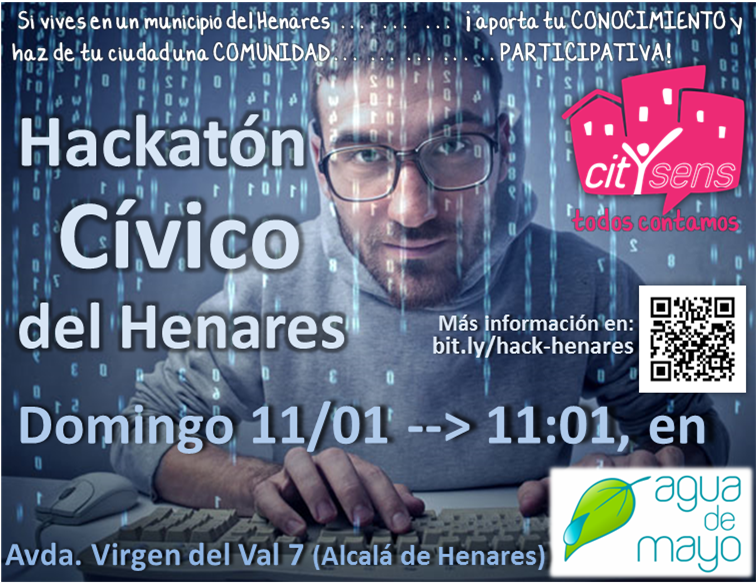 Last Sunday, January 11th, we organized the first “Mini-hackathon Civic del Henares”, together with the citizens’ organization Agua de Mayo. 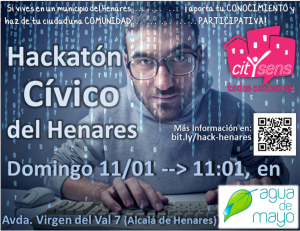 For this event we summoned hackers and citizens from the municipalities of the Henares Valley. 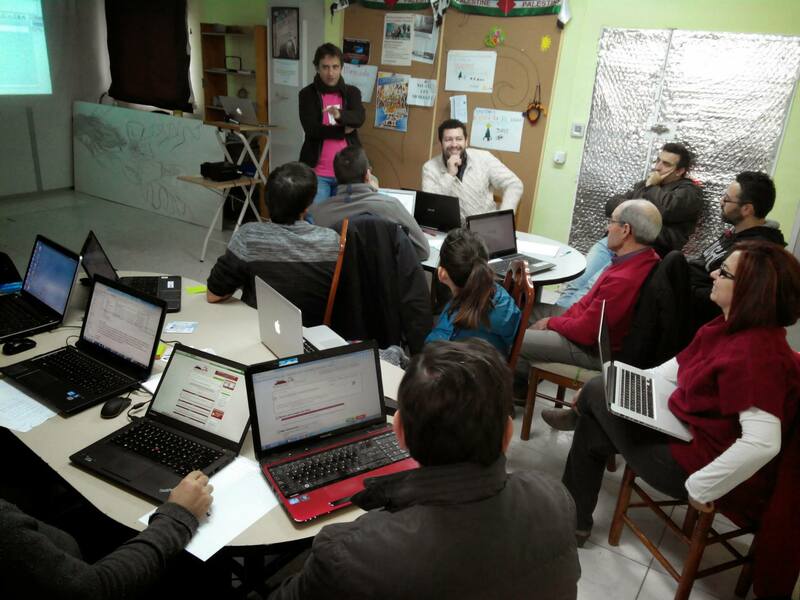 We invited them to share with us their local knowledge and to help us further design the CitySENS system. 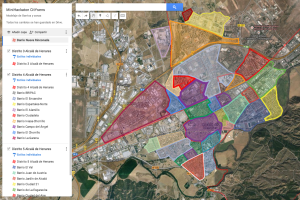 The first, more specific: defining the limits of any municipality neighborhoods Henares Corridor, as a way to identify problems with neighborhoods’ limits and assess how they will be treated in CitySENS. The second, broader: to exchange experiences, concerns and ideas to co-design a Social Citizens Network that leverages collective intelligence in our cities. 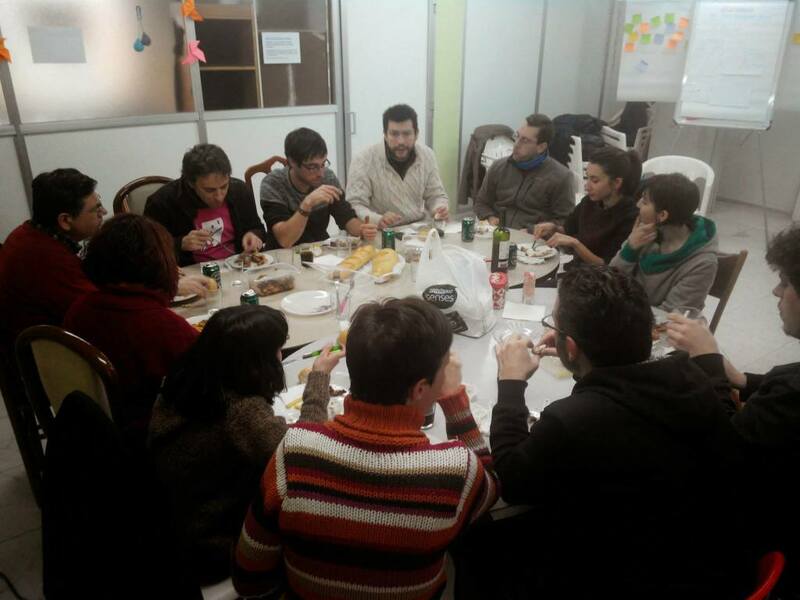 And… well, we improvised on the fly a third objective: to evaluate and solve together any doubts we may have on how to use Internet and social networks to enhance the work of social movements. The hackathon was definitely a great experience that left us all participants a very good taste in the mouth. And not just because we finished the session by sharing a delicious “garlic chicken” 🙂 , but mainly because the collaboration and exchange of ideas that occurred were very enriching. The event was attended by very different people, aged between 11 and 74 years. There were, of course, a few computer scientists and programmers, but also experts in marketing, logistics, social mobilization, architecture… a wonderful mix of citizens’ profiles! And the result was indeed very positive: it fully satisfied all our expected and unexpected goals. This was a participatory design workshop which, in its general features, would seem much similar to those usually included in any EU-funded project. These projects always brag about how earnestly they take “user-centrality” as one of the project’s cornerstones. This is not surprising, as they wouldn’t get funded if they wouldn’t [brag about it 🙂 ]. This is the reason why in its early stages these projects always program such design workshops, where information about future users’ needs is collected, to adjust to them the system’s functionalities. At the same time, however, our event was… SO DIFFERENT! The high levels of complicity, mutual commitment and harmony that workshop’s participants and organizers showed to each other… were quite extraordinary. And the reason why this happened was that the event was organized from below: for and by those below. A real “bottom-up” thing. From the outset it was clear for everybody that our motivation to organize the workshop -and more than that: to create CitySENS- is to serve the social movements. It is not just to advance with a project. Nor to comply with a research protocol. Neither finalizing a “deliverable” or a “working package”. No. Our goal was to meet with them, so we all can listen to each other, share our perspectives and create the relationships that will allow us, working together, find appropriate solutions for their problems. 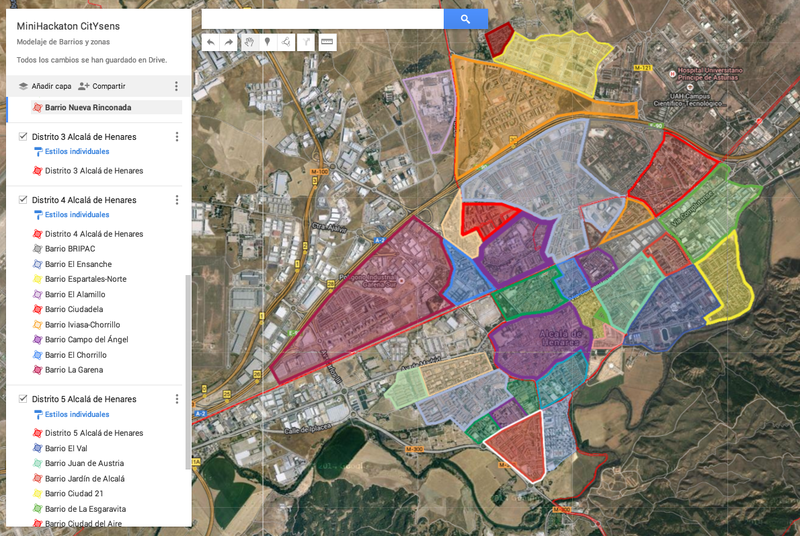 All this reminds me of the considerations made in my PhD thesis, Creating the ‘Symbiotic City’ [es], where I outlined a methodology that could guide the processes of collaborative construction of Civic Systems Software. If we want that a civic software system “works” -ie: that it is successful and provides enough utility to their different users as to make the willing to ‘adopt” it and make it operate sustainably- its creation processes must have a highly collaborative, interdisciplinary and emerging nature. The future users should really play the leading role in these creative processes. This means that a truly trans-disciplinary collaboration is required, which not only encompasses the design of the system but also its processes of construction, testing, initial deployment and uptake of the system (de Cindio et al. 2007). Moreover, the collaborative design does not only refer to the functionality provided by the system; this collaboration should additionally provide the basis to develop the corresponding educational resources and to establish the operating procedures and governance frameworks that will guide its operation and administration. […] When we analyzed the Participatory Design field, we already showed that this is the real challenge that most projects face: to move from the discourse about the ‘centrality of users’ into a practice that really grants them autonomy and relevance; to generate processes which are attractive enough as to motivate representatives of the user groups to engage -even without receiving any compensation- along the entire process of collaborative design, construction, deployment and system operation. And that’s all for now! 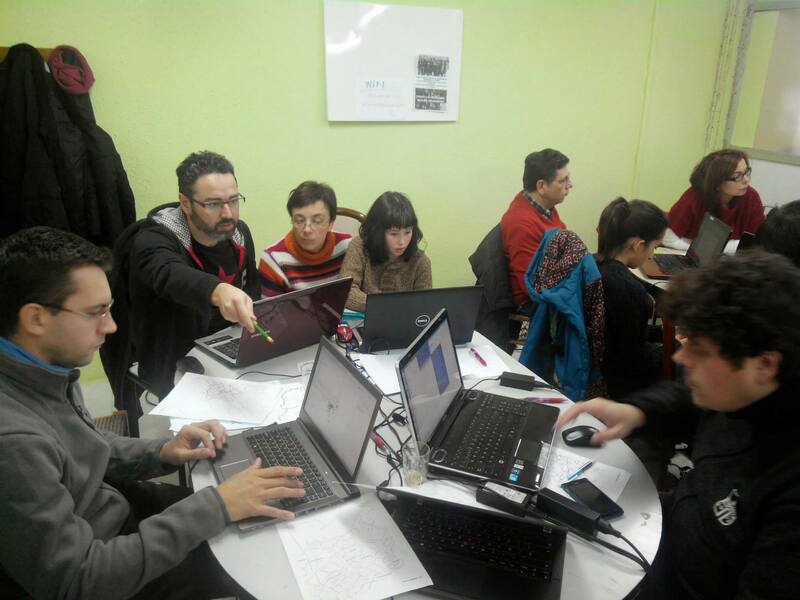 For sure, after this great experience we are going to keep working hard and… there will be more such workshops soon! !